It is November. When Meg comes home from school, Charles Wallace tells her he saw dragons in the twin’s vegetable garden. That night Meg, Calvin and C.W. go to the vegetable garden to meet the Teacher (Blajeny) who explains that what they are seeing isn’t a dragon at all, but a cherubim named Proginoskes. It turns out that C.W. is ill and that Blajeny and Proginoskes are there to make him well – by making him well, they will keep the balance of the universe in check and save it from the evil Echthros. Meg, Calvin and Mr. Jenkins (grade school principal) must travel inside C.W. to have this battle and save Charles’ life as well as the balance of the universe. Do you love A Wind in the Door book? Please share! 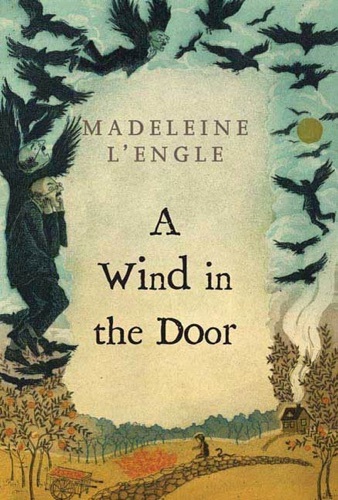 A Wind in the Door - Madeleine L'Engle E-Book coming soon..